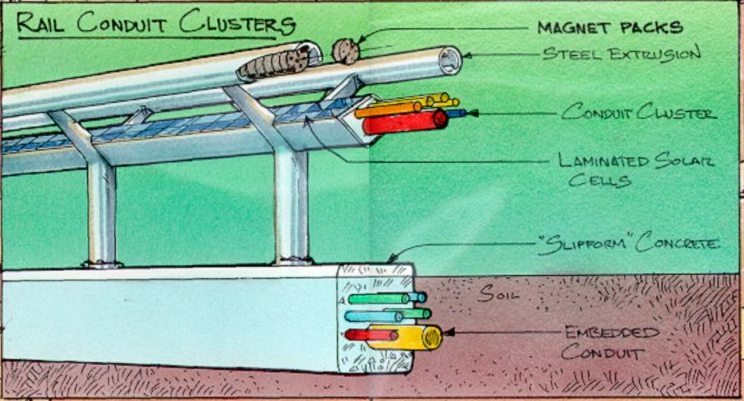 The Rail Conduit Cluster is a new unified form of Municipal Infrastructure in a secure and accurately managed distribution system for passenger transit, water, natural gas, electric, fiber optic, high temperature superconducting cable, liquid or gaseous hydrogen, and pressurized liquefied waste. 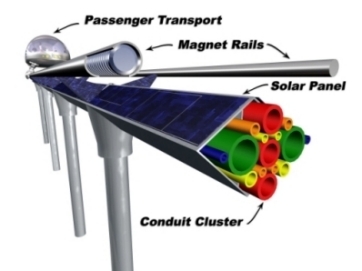 The Central Support of the Rail Conduit Cluster is laminated with solar cells. The Central Support provides a eight foot wide surface area to include also the 8 foot wide surface area on the rail that runs the opposite direction providing a total width of 16 feet of solar panel that runs the entire length of any installation of the Interstate Traveler. Based on 10 watts per square foot at peak time, each mile of rail will produce about 844,800 watts of electricity per hour at peak time. An installation that is 100 miles long would therefore produce about 84,480,000 watts per hour at peak time, or roughly 84 megawatts per hour peak time. Essentially, a 100 mile long installation supports 8.4 million square feet of solar cells.